We sold this bridge system to Tim in Wisconsin. He had a over 100 acres of property out at his cabin in Wisconsin, but the majority of it was cut off by a small river. He wanted to find a way that would allow him to access the rest of his property with his ATV. The bridge he purchased was 40’ long and 6’ wide with a live load capacity of 3,000 lbs. and a snow load capacity of 50 lbs./sq.ft. Tim started off by building up two raised platforms using railroad ties to ensure that the bridge would never be underwater during a flood. He then drove the parts out to the bridge site with his ATV and began the assembly process. He used three sets of scaffolding to set sections of the bridge together. After he seamed up these sections, he screwed down his plywood decking to finish the assembly process. 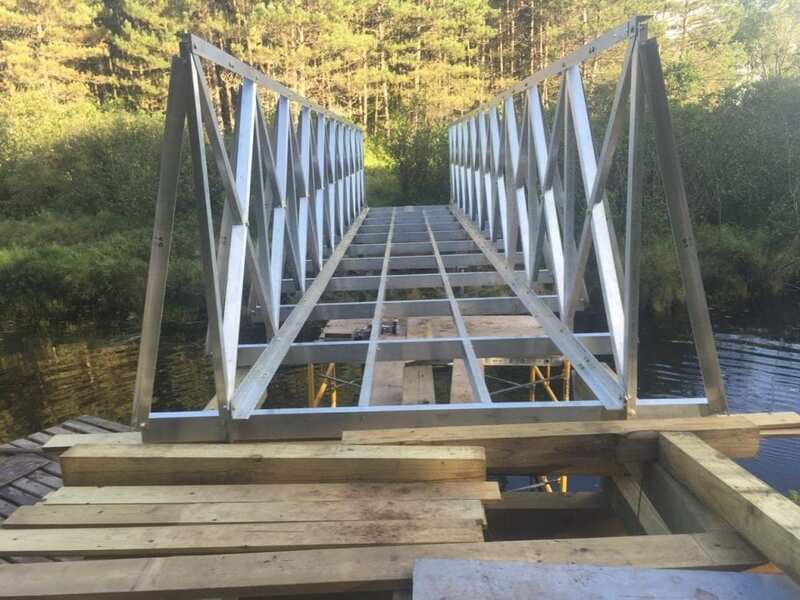 When the pallet of parts arrived for the bridge, Tim called us and asked “Where’s the rest of it?” When the project was completed, he was amazed that a heavy-duty 40’ bridge had arrived on a single 4×8’ pallet.